110 Grill believes that the privacy of personal information is a serious matter. This Privacy Notice applies to our use of personal information that we may collect and that you may provide to 110 Grill at 110 Grill restaurants in the United States, through 110 Grill website or by social media, by text messaging, and in email exchanges of information (collectively referred to hereinafter as the “Sites”). This Privacy Notice describes the types of personal information we collect through the Sites, how we may use the information, with whom we may share it and the choices available to you regarding our use of the information. We also describe the measures we take to safeguard the information and tell you how to contact us about our privacy practices. By visiting our Site, and/or sharing any information with us, you accept our practices as set forth in this Privacy Notice. In addition to the personal information discussed above, when you visit our Site or Sites we may collect certain information by automated means, such as cookies and log files, as well as through internet-based advertising. The information we collect in this manner includes IP address, browser characteristics, device characteristics, operating system, language preferences, referring URLs, information on actions taken on our Sites, and dates and times of website visits. Cookies, Web Beacon and Clickstream. A “cookie” is a text file that websites send to a visitor’s computer or other Internet-connected device to uniquely identify the visitor’s browser or to store information or settings in the browser. A “web beacon”, also known as an Internet tag, pixel tag or clear GIF, links web pages to web servers and their cookies and may be used to transmit information collected through cookies back to a web server. Through these automated collection methods, we obtain “clickstream data”, which is a log of content on which a visitor clicks while browsing a website. As the visitor clicks through the website, a record of the action may be collected and stored. We may link certain data elements we have collected through automated means, such as your browser information, with other information we have obtained about you to let us know, for example, whether you have opened an e-mail we sent to you. Your browser may tell you how to be notified when you receive certain types of cookies or how to restrict or disable certain types of cookies. Please note, however, that without cookies you may not be able to use all of the features of our Sites. Log Files. We may also obtain log files. An IP address is a number that is automatically assigned to your computer whenever you are surfing on the Web. Web servers automatically will identify a computer by its IP address. We use IP addresses to analyze trends, administer the site, track users’ movement and gather broad demographic information for aggregate use. Again, IP addresses are not linked to personally identifiable information. Operating Systems. We may also automatically collect information on an anonymous basis about your use of services, including the type of operating system in use (e.g. Apple OS X, Microsoft Windows), the type of browser you use (e.g., Internet Explorer, Firefox, Safari, Chrome), access times, pages viewed, and the page you visited before navigating to 110 Grill Sites. Mobile App. Additionally, use of the 110 Grill mobile site or application (e.g. iOS or Android devices) may result in the collection of additional information about you such as your proximity to a 110 Grill GPS location. To provide location-based services related to our business, 110 Grill may collect, use, and share your precise location data. This location data is collected anonymously in a form that does not personally identify you and is used by 110 Grill and our partners and licensees to provide and improve location-based products and services. See also our “Do Not Track Policy” below. Social Network Sites. If you use Site features operated by third-party social networking services (such as Facebook), we may receive information you have made available to those services, including the geographic location of your mobile device and other information about you (such as name, email address, gender, locale, time zone, languages, social media profile URL, personal website URL, biographical information, birthday, photo, list of devices, education history, work history, hometown, interests, current city, political views, favorite athlete and teams, relationship status and information, religion, name of significant other, and certain security settings information) and your contacts on those services. Some of these social networking services allow you to push content from our Sites to your contacts or to pull information about your contacts so you can connect with them on our Sites. Some of these services also will facilitate your registration for our Sites or enhance or personalize your experience on our Sites. You should make sure you understand the information your third-party social networking services may make available to our Sites. We may use and disclose the personal information we receive on our Sites through third-party social networking services as described in this Privacy Notice. Internet-Based Advertising. On the Site, or Sites we may collect information about your online activities for use in providing you with advertising about products and services tailored to your individual interests. This section of our Privacy Notice provides details and explains how to exercise your choices. Sometimes third parties unaffiliated with us may conduct marketing campaigns where they offer gift cards to our restaurants, which they have purchased separately, as inducements to enroll in their programs, complete surveys or take other actions. In such cases, requests directed to us to opt out of further communications will not be effective, as we have no control over the activities of such third parties. In addition, we use information collected online through cookies, local shared objects (also known as “Flash cookies”), web beacons and other automated means for purposes such as: (i) customizing our users’ visits to our Sites, (ii) delivering content (including advertising) tailored to our users’ interests; and the manner in which our users browse our Sites, and (iii) managing our business. We may supplement data we collect through automated means with information about your location (such as your zip code) to provide you with content that may be of interest to you. We also use this information to help diagnose technical and service problems, administer our Sites, identify users of our Sites, and gather demographic information about our users. We use clickstream data to determine how much time users spend on web pages of our Sites, how users navigate through our Sites, and how we may tailor our Sites to better meet the needs of our users. You can manage what cookies are set on your device. There are different ways you can opt out of cookies. For example, you may be able to remove or disable cookies from through your web browser. The “Help” portion of the toolbar on most browsers will tell you how to prevent your browser from accepting new cookies, how to have the browser notify you when you receive a new cookie, or how to disable cookies altogether. You also may opt out of targeting or advertising cookies through websites of other third-party organizations such as for example the Digital Advertising Alliance or the Network Advertising Initiative www.aboutads.infor/choices. Please be aware that whether and how you opt out cookies may affect the functionality of 110 Grill site. 110 Grill will not share, sell, rent, loan, trade, lease or otherwise disclose any personal information collected through our Sites, including membership forms or email lists, except as disclosed in this Privacy Notice. When you post a comment on our blogs, 110 Grill website, or our social media channels we may publish your name and user ID on the blog with your comment. Furthermore, if you choose to opt-in to receive future offers and updates by text messaging, email or otherwise your information will be kept in a secure database in order to alert you via e-mail to new features, special offers, updated information and new services. At times, we may be working with third-party companies to support the technical operation of the Site or to execute a specific promotion or program. If the information is to be shared with any third party for the purposes of executing a specific promotion or program, the details will be clearly communicated in the program’s rules, and the third party will have no right to use the personally identifiable information except as necessary to perform services on our behalf or comply with legal requirements. In support of this policy, 110 Grill will make reasonable efforts to enter into written agreements with all third parties to ensure that they will meet privacy standards, including the privacy standards of Children’s Online Privacy Protection Act (COPPA) and the U.S. Commerce Department Safe Harbor provisions. Our Sites contain links to other websites for your convenience and information, including for example gift card purchases, online ordering and the Email Club through the website. These websites are operated by companies not affiliated with 110 Grill, and it is highly likely that these companies will have access to the information you share with 110 Grill to the extent such websites are used Linked websites may have their own privacy policies or notices, which we strongly suggest you review if you visit any linked websites. We are not responsible for the content of any websites that are not affiliated with 110 Grill or for any use of those websites, or for the privacy practices of those websites. Furthermore, 110 Grill is not responsible for the privacy practices of such other sites. We encourage our users to be aware when they leave our site and to read the privacy statements of each and every website that collects personally identifiable information. This privacy statement applies solely to 110 Grill. 110 Grill takes reasonable and appropriate precaution to protect user information. We maintain administrative, technical and physical safeguards designed to protect the personal information you provide against accidental, unlawful or unauthorized destruction, loss, alteration, access, disclosure or use. However, 110 Grill cautions that no network is entirely secure. 110 Grill maintains email lists to keep 110grill.com members informed about breaking events. Individuals must affirmatively ask to join our mailing lists during site registration or by contacting 110 Grill staff directly using the form found in the “Contact Us” section of the Site. We do not sell, rent, loan, trade, or lease the addresses on our list to anyone. In addition, we configure our list server software to refuse to divulge the email addresses of our list subscribers to anyone but authorized 110 Grill staff, including other list subscribers. If a user’s personally identifiable information changes (such as your zip code), or if a user no longer desires our service, we will make reasonable efforts to provide a way to correct, update or remove that user’s personal data provided to us. If you would like to update information we have about you or your preferences, you should contact 110 Grill as set forth below. Furthermore, users who initially opt-in for future offers and updates, who no longer wish to receive our future offers or other promotional materials may subsequently opt-out of receiving these communications by following the specific opt-out instructions found within the communication in question. This Privacy Notice may be updated periodically and without prior notice to you to reflect changes in our practices for collecting personal information. We will post a notice on our Site to notify you of any significant changes to our Privacy Notice and indicate at the top of the notice the effective date of the policy. You should periodically review this page to ensure that you are familiar with the most current version of this Privacy Notice. 110 Grill takes seriously its obligations under the Children’s Online Privacy Protection Act (“COPPA”) concerning the collection of personal information from children under the age of 13. 110 Grill Site is not targeted to children under the age of 13 and we do not knowingly collect personal information from children under the age of thirteen on our Site. Parents should be aware that information that is voluntarily given by children or others in chat sessions, email exchanges, bulletin boards, social media sites or the like may be used by other parties to generate unsolicited email or other contacts. The Company encourages all parents to instruct their children in the safe and responsible use of the Internet. The following set of Terms and Conditions apply to your use of 110 Grill website, its social media pages, mobile apps, text messaging, and email exchanges of information (collectively referred to hereinafter the “Sites”). The Sites are owned, operated, licensed, or controlled by 110 Grill Corporation or any of its related, affiliated, or subsidiary companies (together, “110 Grill”) and is for your personal use. 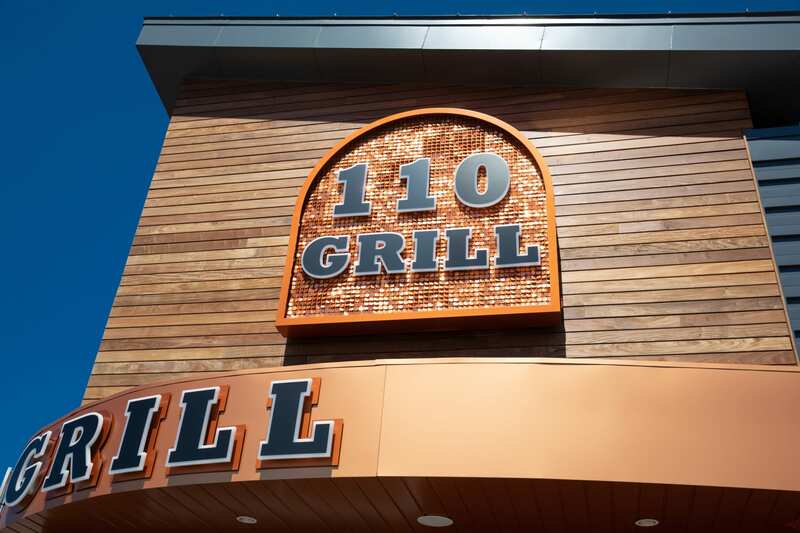 Throughout the Sites, the terms “we,” “us” and “our” refer to 110 Grill. Your access to and use of the Sites is subject to the following Terms and Conditions. 110 Grill offers the Sites, including all information, tools and services available from the Sites, to you, the user, conditioned upon your acceptance of all the terms, conditions, policies and notices stated here. Your use of 110 Grill Sites constitutes your agreement to these Terms and Conditions. If you do NOT agree to these Terms and Conditions, do NOT use all or any part or aspect of the Site. 110 Grill strives to ensure that the information contained in its web site is accurate and reliable. However, 110 Grill and the World Wide Web (or Web Site Host) are not infallible and errors may sometimes occur. Accordingly, 110 Grill is not responsible if information made available on the Sites is inaccurate, incomplete or out-of-date. The material on the Sites is provided for general information only and should not be relied upon or used as the sole basis for making decisions without consulting primary, more accurate, more complete or more timely sources of information. Any reliance on the material on the Site is at your own risk. The Site may contain certain historical information. Historical information necessarily is not current and is provided for your reference only. We reserve the right to modify the contents of the Site at any time, but we have no obligation to update any information on the Sites. You agree that it is your responsibility to monitor changes to the Sites. All content on the website and all of the Sites (including, without limitation, trademarks, service marks, logos, text, design, graphics, logos, icons, images, audio clips, downloads, interfaces, code and software, as well as the selection and arrangement thereof), is the exclusive property of and owned by 110 Grill, its licensors, its content providers, or other third parties and is protected by copyright, trademark and other applicable laws. The content, arrangement and layout of the Sites, including, but not limited to, the trademarks, service marks, logos, package designs, text, graphics, icons, audio clips, downloads, interfaces, code, and software, are also proprietary and are protected from copying, imitation, communication, or simulation under domestic and international laws and are not to be reproduced, communicated, used, displayed, distributed, or transmitted without the express written permission of 110 Grill. The Sites may also contain references to other company, brand and product names, and their trademarks, service marks, and logos. These company, brand and product names and trade and service marks are used herein for identification purposes only and may be the trademarks of their respective owners. The images of people or places displayed, forms, structures, and graphics displayed or found within the Sites are either the property of, or used with permission by 110 Grill. 110 Grill may be, but is not necessarily sponsored by or affiliated with any of owners of the other company, brand and product name appearing on the Sites, and makes no representations about them, their owners, their products or services. 110 Grill, or its licensors or content providers, retain full and complete title to the material provided on the Sites, including all associated intellectual property rights, and provide this material to you under a license that is revocable at any time in 110 Grill sole discretion. 110 Grill neither warrants nor represents that your use of materials on the Sites will not infringe rights of third parties not affiliated with 110 Grill. You may not use contact information provided on the Sites for unauthorized purposes, including marketing. You may not use any hardware or software intended to damage or interfere with the proper working of the Sites or to surreptitiously intercept any system, data or personal information from the Sites. You agree not to interrupt or attempt to interrupt the operation of the Sites in any way. You may access, copy, download and print the material contained on the Sites for your personal and non-commercial use, provided you do not modify or delete any copyright, trademark or other proprietary content that appears on the material you access, copy, download or print. Any other use of content on all or any part of the Sites, including but not limited to the modification, distribution, transmission, performance, broadcast, publication, uploading, licensing, reverse engineering, transfer or sale of, or the creation of derivative works from, any material, information, software, products or services obtained from all or any part of the Sites, or use of the Sites for purposes competitive to 110 Grill, is expressly prohibited without the prior written consent of 110 Grill. By visiting all or any part of the Sites, you do not acquire or obtain by implication or otherwise, any license or right to use or make additional copies of any materials or information displayed on the Sites. Nothing on the Sites shall be construed as granting, by implication, estoppel, or otherwise, any license or right to use any trademark, logo or service mark displayed on the Sites without the owner’s prior written permission, except as otherwise described herein. 110 Grill reserves all rights not expressly granted in and to the Sites and their contents. The Sites and all of their contents, including but not limited to text, design, graphics, interfaces and code, and the selection and arrangement thereof, is protected as a compilation under the copyright laws of the United States and other countries. Any unauthorized use of the materials, structure, sequence, arrangement, or design of the Sites, or trademarks, service marks, logos or trade dress found within the Sites may violate civil or criminal laws, including, but not limited to, copyright laws, trademark laws, the laws of privacy and publicity, and communications regulations and statutes. 110 Grill reserves the right to refuse or cancel any person’s registration for all or any part of the Sites, remove any person from all or any part of the Sites or prohibit any person from using all or any part of the Sites for any reason whatsoever. 110 Grill reserves the right, in its sole discretion, to limit or terminate your access to or use of all or any part of the Sites at any time without notice. Termination of your access or use will not waive or affect any other right or relief to which 110 Grill may be entitled at law or in equity. You acknowledge that you, and not 110 Grill, are responsible for any material or message you may submit via the Sites (including any components of the Site administered by third parties, such as tools that allow you to interact with the Sites through Facebook and other social media platforms), including the legality, reliability, appropriateness, originality and copyright of any such material. You may not upload to, distribute or otherwise publish through the Site any content that (i) is confidential, proprietary, false, fraudulent, libelous, defamatory, obscene, threatening, invasive of privacy or publicity rights, infringing on intellectual property rights, abusive, illegal or otherwise objectionable; (ii) may constitute or encourage a criminal offense, violate the rights of any party or otherwise give rise to liability or violate any law; or (iii) may contain software viruses, political campaigning, chain letters, mass mailings, or any form of “spam.” You may not use a false email address or other identifying information, impersonate any person or entity or otherwise mislead as to the origin of any content. You may not upload commercial content onto the Sites. If you do submit material, and unless we indicate otherwise, you grant 110 Grill an unrestricted, nonexclusive, royalty-free, perpetual, irrevocable and fully sublicensable right to use, reproduce, modify, adapt, publish, translate, create derivative works from, distribute and display such material throughout the world in any media. You further agree that 110 Grill is free to use any ideas, concepts, know-how that you or individuals acting on your behalf provide to 110 Grill. You grant 110 Grill the right to use the name you submit in connection with such material, if it so chooses. You represent and warrant that you own or otherwise control all the rights to the content you post; that the content is accurate; that use of the content you supply does not violate any provision herein and will not cause injury to any person or entity; and that you will indemnify 110 Grill for all claims resulting from content you supply. You agree that 110 Grill will not be liable for any ideas used in its business (including without limitation, product, or advertising ideas) and will not incur any liability as a result of any similarities that may appear in future 110 Grill operations with such Submissions. Without limitation, 110 Grill will have exclusive ownership of all present and future existing rights to any submission of material of every kind and nature everywhere. 110 Grill will be entitled to use material submitted for any commercial or other purpose whatsoever without compensation to you or any other person sending the submission. Some features that may be available on the Sites require registration. By registering at and in consideration of your use of the all or any part of Sites you agree to provide true, accurate, current and complete information about yourself. Some features on the Sites require use of a password. You are responsible for protecting your password. You agree that you will be responsible for any and all statements made, and acts or omissions that occur, through the use of your password. If you have any reason to believe or become aware of any loss, theft or unauthorized use of your password, notify 110 Grill immediately. 110 Grill may assume that any communications 110 Grill receives under your password have been made by you unless 110 Grill receives notice otherwise. You or third parties acting on your behalf are not allowed to frame the Site or use our proprietary marks as meta tags, without our written consent. These marks include, but are not limited to, 110 Grill. You may not use frames or utilize framing techniques or technology to enclose any content included on the Sites without 110 Grill express written consent. Further, you may not utilize any content from all or any part of the Sites in any meta tags or any other “hidden text” techniques or technologies without 110 Grill express written consent. The Sites may contain links to other websites, including for example concerning 110 Grill online ordering and the Email Club, that are not maintained or related to 110 Grill, and operated by third parties. These links are provided as a convenience to you and as an additional avenue of access to the information contained therein and are not sponsored by or affiliated with 110 Grill, its website or any of its Sites. We have not reviewed all the information on those other sites and are not responsible for the content of those or any other sites or any products or services that may be offered through those or any other sites. Inclusion of links to other sites should not be viewed as an endorsement of the content of linked sites. Different terms and conditions may apply to your use of any linked sites. 110 Grill is not responsible for any losses, damages or other liabilities incurred as a result of your use of any linked sites. The links are to be accessed at the user’s own risk, and 110 Grill makes no representations or warranties about the content, completeness, or accuracy of these links or the websites hyper-linked to this Site. YOUR USE OF THE SITES IS AT YOUR SOLE RISK. THE SITES ARE PROVIDED ON AN “AS IS” AND “AS AVAILABLE” BASIS. WE RESERVE THE RIGHT TO RESTRICT OR TERMINATE YOUR ACCESS TO THE SITES OR ANY FEATURE OR PART THEREOF AT ANY TIME. 110 GRILL EXPRESSLY DISCLAIMS ALL WARRANTIES OF ANY KIND, WHETHER EXPRESS OR IMPLIED, INCLUDING BUT NOT LIMITED TO THE IMPLIED WARRANTIES OF MERCHANTABILITY AND FITNESS FOR A PARTICULAR PURPOSE AND ANY WARRANTIES THAT MATERIALS ON THE SITES ARE NONINFRINGING, AS WELL AS WARRANTIES IMPLIED FROM A COURSE OF PERFORMANCE OR COURSE OF DEALING; THAT ACCESS TO THE SITES WILL BE UNINTERRUPTED OR ERROR-FREE; THAT THE SITES WILL BE SECURE; THAT THE SITES OR THE SERVER THAT MAKES THE SITES AVAILABLE WILL BE VIRUS-FREE; THAT INFORMATION ON THE SITES WILL BE COMPLETE, ACCURATE OR TIMELY; THAT DEFECTS WILL BE CORRECTED; OR THAT ANY DATA OR INFORMATION YOU SUBMIT WILL BE SECURE OR FREE FROM UNAUTHORIZED ACCESS OR ACQUISITION. 110 GRILL DOES NOT WARRANT OR MAKE ANY REPRESENTATIONS REGARDING THE USE OF OR THE RESULT OF THE USE OF THE MATERIAL IN THE SITES IN TERMS OF THEIR CORRECTNESS, ACCURACY, RELIABILITY, SECURITY, OR OTHERWISE. IF YOU DOWNLOAD ANY MATERIALS FROM THE SITES, YOU DO SO AT YOUR OWN DISCRETION AND RISK. YOU WILL BE SOLELY RESPONSIBLE FOR ANY DAMAGE TO YOUR COMPUTER SYSTEM OR LOSS OF DATA THAT RESULTS FROM THE DOWNLOAD OF ANY SUCH MATERIALS. NO ADVICE OR INFORMATION, WHETHER ORAL OR WRITTEN, OBTAINED BY YOU FROM 110 GRILL OR THROUGH OR FROM THE SITES SHALL CREATE ANY WARRANTY OF ANY KIND. COMPANY DOES NOT MAKE ANY WARRANTIES OR REPRESENTATIONS REGARDING THE USE OF THE MATERIALS ON THE SITES IN TERMS OF THEIR COMPLETENESS, CORRECTNESS, ACCURACY, ADEQUACY, USEFULNESS, TIMELINESS, RELIABILITY OR OTHERWISE. IN CERTAIN JURISDICTIONS, THE LAW MAY NOT PERMIT THE DISCLAIMER OF WARRANTIES, SO THE ABOVE DISCLAIMER MAY NOT APPLY TO YOU. YOU ACKNOWLEDGE AND AGREE THAT YOU ASSUME FULL RESPONSIBILITY FOR YOUR USE OF THE SITES. YOU ACKNOWLEDGE AND AGREE THAT ANY INFORMATION YOU SEND OR RECEIVE DURING YOUR USE OF THE SITES MAY NOT BE SECURE AND MAY BE INTERCEPTED BY UNAUTHORIZED PARTIES. YOU ACKNOWLEDGE AND AGREE THAT YOUR USE OF THE SITES IS AT YOUR OWN RISK AND THAT THE SITES ARE MADE AVAILABLE TO YOU AT NO CHARGE. RECOGNIZING SUCH, YOU ACKNOWLEDGE AND AGREE THAT, TO THE FULLEST EXTENT PERMITTED BY APPLICABLE LAW, NEITHER 110 GRILL NOR ITS SUPPLIERS OR THIRD PARTY CONTENT PROVIDERS WILL BE LIABLE FOR ANY DIRECT, INDIRECT, PUNITIVE, EXEMPLARY, INCIDENTAL, SPECIAL, CONSEQUENTIAL OR OTHER DAMAGES ARISING OUT OF OR IN ANY WAY RELATED TO THE SITES, OR ANY OTHER SITES YOU ACCESS THROUGH A LINK FROM THE SITES OR FROM ANY ACTIONS WE TAKE OR FAIL TO TAKE AS A RESULT OF COMMUNICATIONS YOU SEND TO US, OR THE DELAY OR INABILITY TO USE THE SITES, OR FOR ANY INFORMATION, PRODUCTS OR SERVICES ADVERTISED IN OR OBTAINED THROUGH THE SITES, 110 GRILL REMOVAL OR DELETION OF ANY MATERIALS SUBMITTED OR POSTED ON ITS SITES, OR OTHERWISE ARISING OUT OF THE USE OF THE SITES, WHETHER BASED ON CONTRACT, TORT, STRICT LIABILITY OR OTHERWISE, EVEN IF 110 GRILL OR ANY OF ITS SUPPLIERS OR THIRD PARTY VENDORS HAS BEEN ADVISED OF THE POSSIBILITY OF DAMAGES. THIS DISCLAIMER APPLIES, WITHOUT LIMITATION, TO ANY DAMAGES OR INJURY ARISING FROM ANY FAILURE OF PERFORMANCE, ERROR, OMISSION, INTERRUPTION, DELETION, DEFECTS, DELAY IN OPERATION OR TRANSMISSION, COMPUTER VIRUSES, FILE CORRUPTION, COMMUNICATION-LINE FAILURE, NETWORK OR SYSTEM OUTAGE, YOUR LOSS OF PROFITS, OR THEFT, DESTRUCTION, UNAUTHORIZED ACCESS TO, ALTERATION OF, LOSS OR USE OF ANY RECORD OR DATA, AND ANY OTHER TANGIBLE OR INTANGIBLE LOSS. YOU SPECIFICALLY ACKNOWLEDGE AND AGREE THAT NEITHER 110 GRILL NOR ITS SUPPLIERS OR THIRD PARTY VENDORS SHALL BE LIABLE FOR ANY DEFAMATORY, OFFENSIVE OR ILLEGAL CONDUCT OF ANY USER OF THE SITES. YOUR SOLE AND EXCLUSIVE REMEDY FOR ANY OF THE ABOVE CLAIMS OR ANY DISPUTE WITH 110 GRILL IS TO DISCONTINUE YOUR USE OF THE SITES. YOU AND 110 GRILL AGREE THAT ANY CAUSE OF ACTION ARISING OUT OF OR RELATED TO THE SITES MUST COMMENCE WITHIN ONE (1) YEAR AFTER THE CAUSE OF ACTION ACCRUES OR THE CAUSE OF ACTION IS PERMANENTLY BARRED. BECAUSE SOME JURISDICTIONS DO NOT ALLOW LIMITATIONS ON HOW LONG AN IMPLIED WARRANTY LASTS, OR THE EXCLUSION OR LIMITATION OF LIABILITY FOR CONSEQUENTIAL OR INCIDENTAL DAMAGES, ALL OR A PORTION OF THE ABOVE LIMITATION MAY NOT APPLY TO YOU. purchase within seven to ten business days. “Please be assured that gift cards will ship out within two days of purchase via U.S. Postal Service (USPS). You agree to indemnify, defend and hold harmless 110 Grill and its officers, directors, employees, contractors, agents, licensors, service providers, subcontractors and suppliers from and against any and all losses, liabilities, expenses, damages and costs, including reasonable attorneys’ fees and costs, arising or resulting from your use of all or any part of the Sites and any violation of these Terms and Conditions. If you cause a technical disruption of all or any part of the Sites or the systems transmitting such Sites to you or others, you agree to be responsible for any and all losses, liabilities, expenses, damages and costs, including reasonable attorneys’ fees and court costs, arising or resulting from that disruption. 110 Grill reserves the right, at its own expense, to assume exclusive defense and control of any matter otherwise subject to indemnification by you and, in such case, you agree to cooperate with 110 Grill in the defense of such matter. The laws of the Commonwealth of Massachusetts govern these Terms and Conditions and your use of the Site, and you irrevocably consent to the jurisdiction of the courts located in Suffolk County in the Commonwealth of Massachusetts for any action arising out of or relating to these Terms and Conditions. We recognize that it is possible for you to obtain access to the Site from any jurisdiction in the world, but we have no practical ability to prevent such access. The Sites have been designed to comply with the laws of Massachusetts and of the United States. If any material on the Sites, or your use of all or any part of the Sites, is contrary to the laws of the place where you are when you access it, the Sites (or any part affected thereby) is not intended for you, and we ask you not to use such Sites. You are responsible for informing yourself of the laws of your jurisdiction and complying with them. 110 Grill reserves the right in its sole discretion to change, modify, add or remove any portion of these Terms and Conditions, in whole or in part, at any time, by posting revised terms on the relevant Sites. It is your responsibility to check periodically for any changes we make to the Terms and Conditions. Revised terms will take effect immediately after their publication on the relevant Sites and will apply only on a going-forward basis. Your continued use of all or any part of the Sites after that point signifies that you accept the changes. This agreement and any policies or operating rules posted on the website or any of the Sites constitute the entire agreement and understanding between you and 110 Grill with respect to the subject matter thereof and supersede all prior or contemporaneous communications and proposals, whether oral or written, between the parties with respect to such subject matter. A printed version of these Terms and Conditions shall be admissible in judicial or administrative proceedings based on or relating to use of the Site to the same extent and subject to the same conditions as other business documents and records originally generated and maintained in printed form.